Thank you for joining me as we count down to the next MFT release. We are five days away from the big day! All the new Stamps, Die-namics, and Stencils will be available on Tuesday, May 5 at 10:00pm EST. Be sure to check out the MFT Blog to see all the new items being revealed today. Don't forget to leave a comment on the MFT Blog countdown posts, YOU could win one of the five $75.00 gift vouchers. 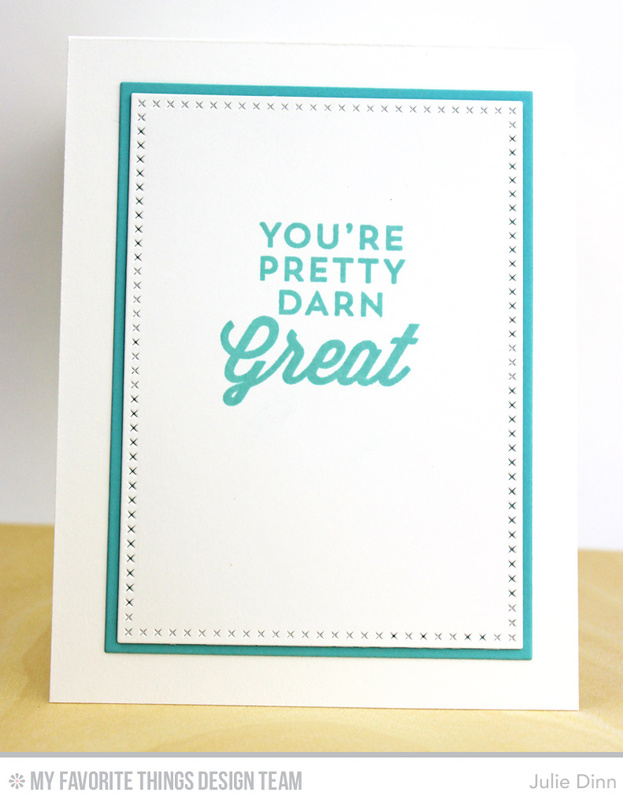 I have two fun cards to share with you today, they both feature the new stamps and dies from Lisa Johnson. 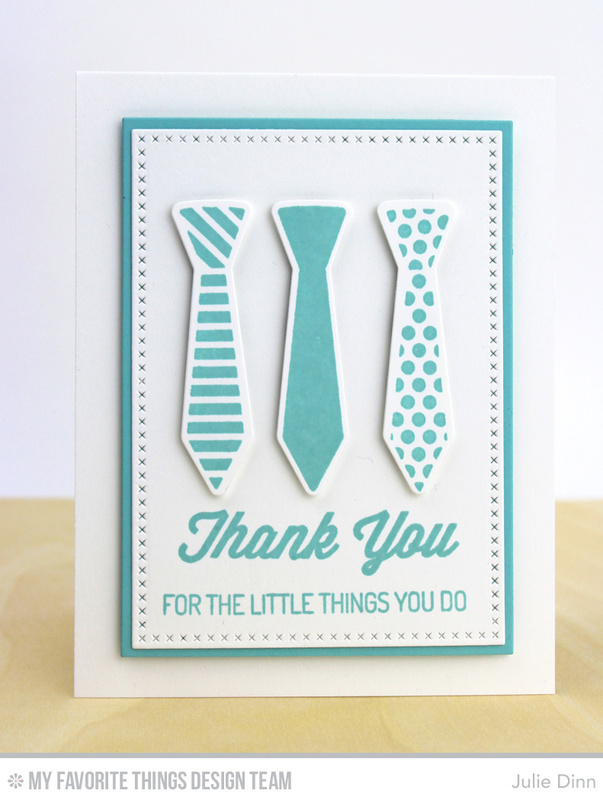 The first card features the Terrific Ties stamp set and co-ordinating Die-namics. Aren't the different patterns on the ties fabulous? I stamped the ties in four colours After Midnight, Summer Splash, Lavender Fields, and Sour Apple. I then die-cut the ties with the Terrific Ties Die-namics. The dies were placed on a panel created with the Blueprints 23 Die-namics. The sentiment was stamped in After Midnight Premium Dye Ink. 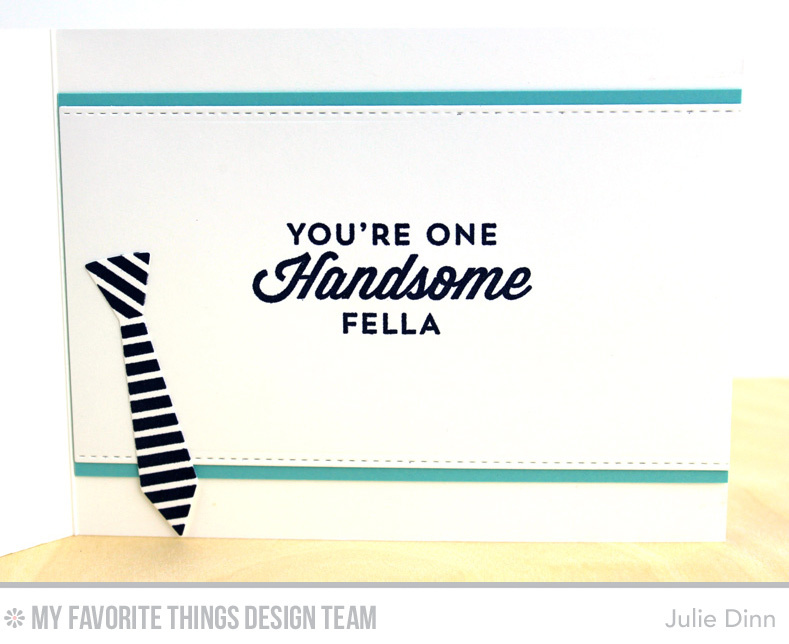 On the inside of the card, I stamped another sentiment from Terrific Ties and I added one more striped tie. 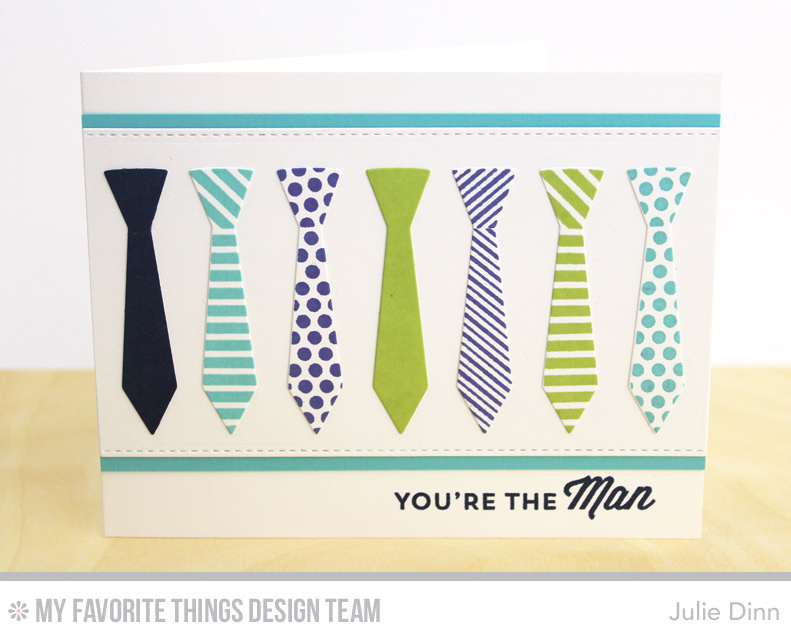 My second cards features the Terrific Ties stamp set and Die-namics, along with the For the Boys stamp set. These sets work so well together. I stamped the ties in Summer Splash Premium Dye Ink on Smooth White card stock. I used the larger die to die-cut the ties, this die gives you that nice border around the stamped image. I love that you have the two different sized tie dies in this one set. I love having options! The ties and sentiments were placed on a Cross-Stitch Rectangle STAX Die-namics. I am so excited about these new STAX dies! The sentiments are from the For the Boys stamp set. On the inside of the card, I stamped a sentiment from the For the Boys stamp set. Great cards, Julie. Love the ties and how you paired the sentiments. I loooooove your white & aqua colour combo!!! Awesome! Julie, these are fantastic masculine cards. As I've said before, I have a real challenge every time I need to make a masculine card. Of course I don't have a lot to work with as I have mostly flowers. Up to now there always seemed to be more available for women than men??? Happy to see these! beautiful card in a perfect color! I love that Summer Splash blue you used in all your cards. That is so pretty.